Near the top of Mt. Diablo stands a challenging rock climb called Amazing Face. Climbers who wish to scale it had better go soon, as the state may close the park and hundreds of others. But those who do ascend the rock may learn a lesson that applies to our financial crisis. 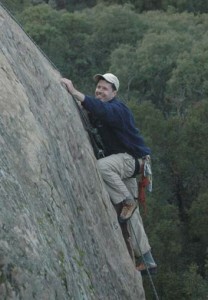 To climb the tiny cracks and edges that texture the sandstone involves risk and requires experience and skill. That’s why the most capable member of any climbing team leads the hardest terrain, and anchors a rope for those who follow. California also has leaders to help us through hardship. Our governor and Legislature recently approved unpopular tax hikes and multi-billion dollar cuts. But critics should remember these lawmakers are only part of our team, with limited control of their effort’s outcome. A capable belayer is essential in climbing. This climber carefully pays out rope as the leader ascends and secures the line instantly if a fall occurs. When I led Amazing Face, which wasn’t easy, my teammate’s skillful support made it possible. I can’t imagine climbing without a trusted, supportive partner. Yet California voters have jerked the rope in our moment of crisis, tearing their leaders into a disastrous fall. Before condemning lawmakers for failing to lead, consider the conflicting imperatives Californians imposed on them at the ballot box. Voters limited taxes through a property tax cap and a nearly unattainable two-thirds requirement to raise any taxes. They set term limits that guarantee lawmakers’ inexperience. Californians spent without providing money countless times, like last year’s $20 billion rail measure. But when Gov. Davis raised vehicle fees, voters kicked him out immediately. If a belayer won’t feed out rope, a leader can’t climb. Likewise, when state leaders have so little control of our finances, they have no chance to meet our expectations. Place blame where it belongs: on our out-of-control initiative process that impedes our progress like a Gordian knot in a climbing rope.